With a history as sweet as it tastes, saltwater taffy has been a popular East Coast summer treat for over one hundred years! 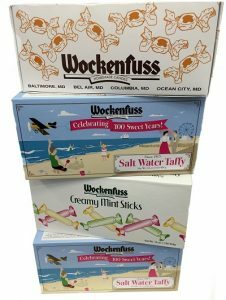 Can you remember a summer that didn’t include enjoying Wockenfuss saltwater taffy while walking the Ocean City boardwalk? For most Marylanders, saltwater taffy is the taste of summer. No matter which flavors you prefer, there’s a saltwater taffy that brings back childhood memories of summers well spent on the beach. With a history as sweet as it tastes, saltwater taffy has been a popular East Coast treat for over one hundred years! Originally produced in Atlantic City, New Jersey, soft taffy was invented in the late 1800s. This was about the same time that many American candy-makers, like Wockenfuss Candies in Baltimore, were getting their start. An Atlantic City candy store owner thought he lost his candies when the store was flooded during a severe storm. A young girl came into his shop after the storm and asked for some taffy. He jokingly offered her some “salt water taffy” after his taffy stock was soaked in ocean water. She agreed to try a piece and liked it so much that she happily purchased some and showed her friends. After overhearing the conversation, the store-owner’s mother said she liked the name “saltwater taffy”, and that’s what the summer sweet has been called ever since. Originally, taffy was cooked in large copper pots that were placed over an open fire. After cooking, the taffy was cooled on marble slabs and then pulled from a large hook called the “taffy pull.” After being pulled to five feet in length, the taffy was looped over itself to create more aeration in the candy, keeping it soft and pliable. From there, the taffy was hand-rolled on marble surfaces and cut into two-inch pieces before being wrapped in wax paper that was twisted at either end. Whether you like peanut butter, chocolate, or an assortment of taffy flavors, all saltwater taffy is made with the same main ingredients. Wockenfuss saltwater taffy is made with corn syrup, sugar, water, hydrogenated palm kernel oil [hydrogenated palm kernel oil and soy lecithin (an emulsifier)], molasses, natural peanut butter (dry-roasted peanuts and salt), hydrogenated vegetable oil, walnuts, chocolate liquor (processed with alkali), natural and artificial Flavors, soy lecithin, salt, vanilla extract and artificial colors (FD&C Blue 1, Blue 2, Red 3, Red 40, Yellow 5 and Yellow 6). Another thing worth noting is despite its name, it’s not actually made with Atlantic Ocean saltwater; just salt and water! This entry was posted on Friday, June 22nd, 2018 at 1:14 pm. You can skip to the end and leave a response. Pinging is currently not allowed.